Specially designed threaded collar nuts that can be machined from a wide variety of materials, in bore sizes from 0.25” to 12” with virtually any thread style and O.D. treatment to fit lock-washers and adapters are offered. 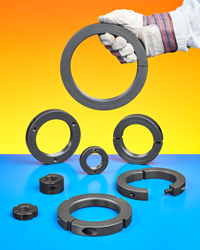 Stafford Special Threaded Shaft Collars & Bearing Lock Nuts can be supplied in singles to production volumes. Available for OEMs and MRO applications, these special designs are offered in one-, two-piece, and hinged styles with different size O.D.s. Stafford Manufacturing Corp. has introduced specially designed threaded collar nuts that can be machined from a wide variety of materials, in bore sizes from 0.25” to 12” with virtually any thread style and O.D. treatment to fit lock-washers and adapters. Stafford Special Threaded Shaft Collars & Bearing Lock Nuts can be machined from aluminum, steel, stainless steel, and other alloys in bore sizes from 0.25” up 12” I.D. Featuring bearing-, ACME-, stub ACME-, UNC/UNF-, single point and multi-start thread styles, they can include spanner wrench slots, face holes, heat treating, and other customer design requirements. Offered in one-, two-piece, and hinged styles with different size O.D.s., Stafford Special Threaded Shaft Collars & Bearing Lock Nuts can be supplied in singles to production volumes. Available for OEMs and MRO applications, they are suitable for packaging conveyors, excavation and heavy construction machinery, petrochemical, processing equipment, and other uses. Stafford Special Threaded Shaft Collars & Bearing Lock Nuts are priced according to configuration and quantity. Pricing is available upon request.